Since I didn't post a guilty pleasure this week I wanted to share one of my addictions and my new addition. I am sure that no one is surprised that I have a bead addiction. I mean who makes jewelry and doesn't. Well this year I have also became addicted to art beads. I try to pick up some each paycheck to build up my collection. Well yesterday I picked up some more. This first set is from an artist that I found by accident on Etsy. 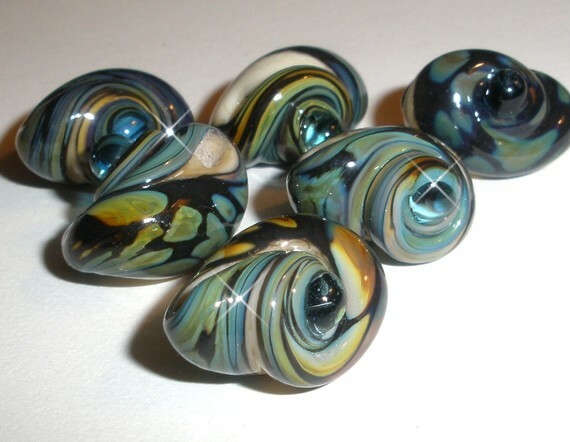 The name of the shop is BeatleBabyGlassworks and just look at this gorgeous set. The other set that I picked up is from an artist that I have purchased from before. 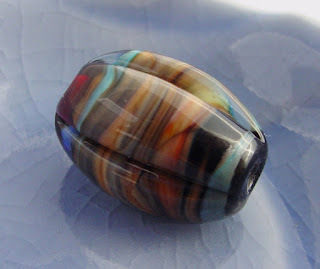 Fantastic prices and interesting beads. The artist is Blue Dish Beads. On another note, I will be posting the winner of my Spring Fashionista giveaway later today. I was going to do so yesterday but I got hit by a nasty migraine last night. OMg... thank you for that shop link to beetlebaby ..I love those sandpebble sets... but I may have to cave and use up a wee bit of my tax refund to get the escargot set as soon as my other orders get here!